Ernest Bloch wore his Jewish identity as proudly as Duke Ellington did his American Blackness, or Modest Mussorgsky did his Russianess. He absorbed those traditional traits that made Jewish music different, he expanded on them, and he created a vocabulary that was not only unique, but also would prove to be a wellspring for many composers who would follow. The Trois Poemes Juifs were written in 1913. The date is significant since the movies had not yet developed sound. This is all a preface to the first of these poems, entitled Danse. Bloch said of it: "This music is all in the coloring; coloring rather somber, mystical and languorous." By the time filmdom was hiring composers, these colors would be labeled "exotic" and splashed around every Technicolor pseudo-recreation of the ancient past. In other words, if you think that you have heard this music before (assuming that you haven't) it is because it has been counterfeited thousands of times. The second movement entitled "Rite" is, according to Bloch, "more emotional, but...solemn and distant." The concluding Cortege Funebre is appropriately titled. Bloch, along with his Swiss contemporary Arthur Honegger, had the ability to write darkly colored march movements that have both impetus and gravity. This funeral march is no exception. Again Bloch's words: "This is more human. My father died...these 'Poems' are dedicated to his memory." 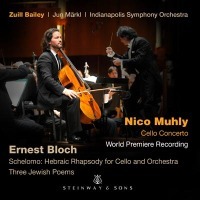 Halfway through the music becomes more serene as Bloch depicts the idea that: "the memory of our dear departed ones is not effaced; they live forever in our hearts." This has long been one of the few works that Bloch wrote which gets performed with any regularity. It is not hard to see why, with its attractive melodies, fascinating orchestration, and emotional fervor.